CD84 is a member of the CD2 subset of the Ig superfamily of cell surface molecules. Its cytoplasmic tail binds to Src homology 2 domain-containing protein 1A (signaling lymphocytic activation molecule-associated protein), a protein encoded by the X-linked lymphoproliferative disease gene. It is preferentially expressed on B lymphocytes, monocytes, and platelets. We show that it is also expressed on thymocytes and T cells. CD84 was positive on CD4−CD8− thymocytes, and its expression decreased with cell maturation. It is expressed on mature T cells preferentially on CD45RO+. To identify the CD84 ligand, we generated a soluble Ig fusion protein containing the human CD84 extracellular domains (CD84-Ig). Because receptor-ligand interactions occur between several members of this subfamily, we assayed CD84-Ig binding with all members of the CD2 family. CD84-Ig bound to CD84-transfected cells, whereas no binding was detected with cells expressing other CD2 subfamily receptors, showing that CD84 binds to itself. Anti-CD84 mAbs recognizing epitopes wholly within domain 1 of CD84 blocked the binding of the CD84-Ig fusion protein to CD84-transfected cells and platelets. Data from CD84 domain human/mouse chimeras further revealed that only the first extracellular domain of the molecule is involved in the ligand receptor recognition. The CD84-CD84 interaction was independent of its cytoplasmic tail. Finally, concurrent ligation of human CD84 with mAbs or CD84-Ig and CD3 enhanced IFN-γ secretion in human lymphocytes. Thus, CD84 is its own ligand and acts as a costimulatory molecule. The CD2 subfamily of cell surface molecules includes CD2, CD58, CD48, CD150 (signaling lymphocytic activation molecule), CD84, CD229 (Ly9), and CD244 (2B4). The receptors of this family, in particular CD2, CD244, and CD150, contribute to the activation of T cells and NK cells (1). Structural features based on the homology within the extracellular domains define membership in this subfamily. These glycoproteins have a similar pattern of conserved disulfide bonds that are characterized by the presence of one membrane-distal V set and one membrane-proximal C2-set of Ig superfamily domains, with the exception of CD229, which contains a tandem repeat of two V-C2 set domains (2). CD84 is expressed as a single-chain cell surface glycoprotein of 64,000–82,000, which is highly glycosylated (3). It was first identified as a differentiation Ag predominately expressed on B lymphocytes, monocytes, and platelets (4). Later it was observed that some T lymphocytes were also positive, but less intense (5). Human CD84 and other members of the family (CD48, CD150, CD244, and CD229) are situated in a segment of 250 kb on chromosome 1q23, and the homologous mouse genes are located on the syntenic region of mouse chromosome 1 (3, 6). In contrast, CD2 and CD58 are situated in the short arm of human chromosome 1 (1p13) and mouse chromosome 3. It has been suggested that the members of the CD2-subset of Ig superfamily molecules diverged by gene duplication from a common ancestor originally encoding a homophilic cell adhesion molecule (7). Several receptor-ligand interactions between members of this subfamily have been described. The first interaction reported was between human CD2 and CD58 (8). However, the ligand for rodent CD2 was identified as CD48 (9). Although human CD48 is also a ligand for human CD2, its affinity for CD2 is ∼100-fold lower (10). Later, CD48 was shown to be a high affinity ligand for CD244 (11, 12). Recently, homophilic binding for CD150 has been reported (13, 14). The extracellular region of CD150 has been identified as a receptor for measles virus (15). Another common feature of these receptors is that they induce cellular activation. Although the function of CD84 is unknown, other members of the subfamily such as CD2, CD244, and CD150 are known to activate lymphocytes, suggesting that the CD84 molecule is also involved in leukocyte activation. CD2 promotes cell adhesion, calcium flux, tyrosine phosphorylation of intracellular substrates, proliferation, cytokine production, and cytotoxicity (16). CD244 ligation on human NK results in cell adhesion, increased cytotoxicity, and cytokine secretion (17, 18). Anti-CD150 mAbs promote the proliferation of activated human T cells (13) and induce IFN-γ secretion (19, 20, 21). The cytoplasmic domains of CD150 and CD244 are quite distinct from that of CD2. Whereas the CD2 cytoplasmic domain contains proline-rich sequences that may mediate signal transduction, CD150 and CD244 contain unique tyrosine-based motifs. The TxYxxV/I present in both receptors interacts with Src homology 2 domain containing tyrosine phosphatase (SHP)-23 and a novel Src homology 2-domain-containing protein 1A (SH2D1A), also referred to as signaling lymphocytic activation molecule-associated protein (SAP). Mutations of the SH2D1A gene cause a primary immunodeficiency called X-linked lymphoproliferative syndrome (XLP), which is characterized by increased susceptibility to EBV infection (22, 23, 24). The CD84 cytoplasmic region contains two tyrosine motifs identical with those found in CD150 and CD244. Recently, it has been shown that SHP-2 and SH2D1A (SAP) bind to the phosphorylated CD84 cytoplasmic tail (25). Here we show that CD84 is expressed on thymocytes and T cells, mainly CD45RO+, and we provide the first evidence that CD84 binds to itself and its ligation leads to T cell activation and cytokine secretion. Cell lines COS and NS1 (murine myeloma cell line) were obtained from the American Type Culture Collection (Manassas, VA). PBMCs were isolated by Ficoll density gradient centrifugation from buffy coats of cells obtained from healthy donors. Thymocytes and platelets were isolated as described previously (26, 27). Thymi were obtained from three children (aged 3–7 yr) who underwent cardiac surgery. None of them presented a history of immunological diseases. The protocol was approved by the ethics committee of our institution. The following mAbs and reagents were obtained from BD PharMingen (San Diego, CA): anti-human IFN-γ (clone NIB42), anti-human biotinylated IFN-γ (clone 4SB3), anti-human CD3-allophycocyanin, CD19-FITC, CD2-PE, CD58-PE, CD4-FITC, CD8-PerCP, biotin anti-mouse κ L chain, IFN-γ standard, and murine CD62-P-Ig. Anti-human CD45RO- FITC was obtained from Sigma (St. Louis, MO). The mAbs anti-human CD3 (clone 332A3) and CD48 (clone 156.4H9) were gifts from R. Vilella (Hospital Clinic, Barcelona, Spain). Anti-human CD150 (clone IPO-3) was obtained from Kamiya Biomedical (Seattle, WA), and anti-human 2B4-PE (clone C1.7) was purchased from Immunotech (Marseilles, France). Human Ly-9 mAb (clone HLy-9.1.84) was produced in our laboratory, as was control Ab, anti-CD62P (clone 2.3) IgG1 isotype. Streptavidin-PE was obtained from Southern Biotechnology Associates (Birmingham, AL), and biotinylated anti-human and goat F(ab′)2 anti-mouse FITC were purchased from Caltag Laboratories (Burlingame, CA). Human cells and tissues were obtained in accordance with protocols approved by the ethics committee of the Hospital Clinic of Barcelona (Barcelona, Spain). A panel of new anti-CD84 mAbs was generated by fusing NS1 with spleen cells from BALB/c mice that had been immunized twice with 300.19 cells stably transfected with the CD84 full-length DNA. Twelve mAbs reactive with CD84-transfected cells, but not with untransfected cells, were produced. The mAbs were purified with a protein A column (Bio-Rad, Hercules, CA), and we selected the clones CD84.1.1 (IgG1-κ), CD84.1.21 (IgG2a-κ), CD84.1.7 (IgG1-κ), and CD84.2.151 (IgG1-κ). Fab were obtained using the Immunopure Fab and F(ab′)2 kit (Pierce, Rockford, IL) following the instructions of the manufacturer. Briefly, purified Abs (1 mg) were diluted in digestion buffer containing 40 mg cysteine-HCl in 2 ml ImmunoPure IG1 digestion buffer (10 times) and applied to an immobilized ficin column. Fab were generated after 3–5 h of digestion at 37°C. They were eluted and separated from undigested IgG and Fc fragments using a protein A column. Their purity was assessed by SDS-PAGE, and the absence of reactivity with the anti-human IgG was shown by flow cytometry. Fab were used immediately after purification or frozen at −80°C. The CD84-Ig fusion protein containing the CD33 leader peptide and the Fc region of human IgG1 was obtained by inserting the human CD84 sequence corresponding to the two extracellular domains into the mammalian expression vector signal pIg-Tail (R&D Systems, Minneapolis, MN). The CD84 oligonucleotides used were: as a forward oligonucleotide, 5′-GAG CGG ATC CAA AAG ACT CAG AAA TCT TCA C-3′; and as a reverse oligonucleotide, 5′-CAC AGG ATC CAC TTA CCT GTA CGG AAG CCC ATT GCG ATG T-3′. Ly9-Ig was used as a control with the following oligonucleotides: 5′-AGG AAG ATC TAA AGG ACT CAG CCC CAA CAG TGG T-3′ as a forward primer and 5′-AGG AAG ATC TAC TTA CCT GTT CTG GAG GCT CCT GGA TCT GTA C-3′ as a reverse primer. The constructs were stably transfected in NS-1 cells by electroporation. Cells were cultured in INTEGRA CL 350 flasks (Integra Biosciences, Wallisellen, Switzerland), and the supernatants containing the fusion proteins were purified as described above for the anti-CD84 Abs. Cells were stained with anti-human CD4-FITC, CD8-PerCP, and biotinylated anti-CD84 (clone CD84.1.1) for 30 min at 4°C. They were then washed with cold PBS and incubated with streptavidin-PE (1/400 final dilution) for 30 min at 4°C. Samples were washed and measured by FACS (FACSCalibur cytometer, BD Biosciences, San Jose, CA). Similarly, a triple staining was conducted with lymphocytes from peripheral blood using anti-human CD3-allophycocyanin, CD19-FITC, and biotinylated anti-CD84. To test CD84 expression on memory cells, lymphocytes were stained with CD3-allophycocyanin, CD45RO-FITC, and biotinylated anti-CD84. A parallel isotype control experiment was performed. When CD84-Ig fusion protein staining was assayed, cells were incubated with a biotinylated goat anti-human IgG as a second step at 4°C for 30 min. They were then washed, streptavidin-PE was added at a 1/400 final dilution, and incubation proceeded at 4°C for 30 min. Thereafter, they were washed and immediately analyzed by FACS. Ten thousand cells were counted for each sample. COS-7 cells were transfected with human CD84, CD229 (Ly9), CD150 (signaling lymphocytic activation molecule), CD48, CD2, CD58, and CD244 (2B4) cDNAs using the LipofectAMINE Plus reagent (Life Technologies, Rockville, MD). After 48 h of incubation, cells were labeled with biotinylated mAbs against CD84 (CD84 1.1) or Ly-9 (HL9.1.84) or with PE-directed labeled Abs against CD150, CD48, CD2, CD58, or CD244 to detect the expression of the transfected molecules. CD84-Ig fusion protein binding assay was conducted as described above. The mAb cross-blocking was performed as described previously (28). 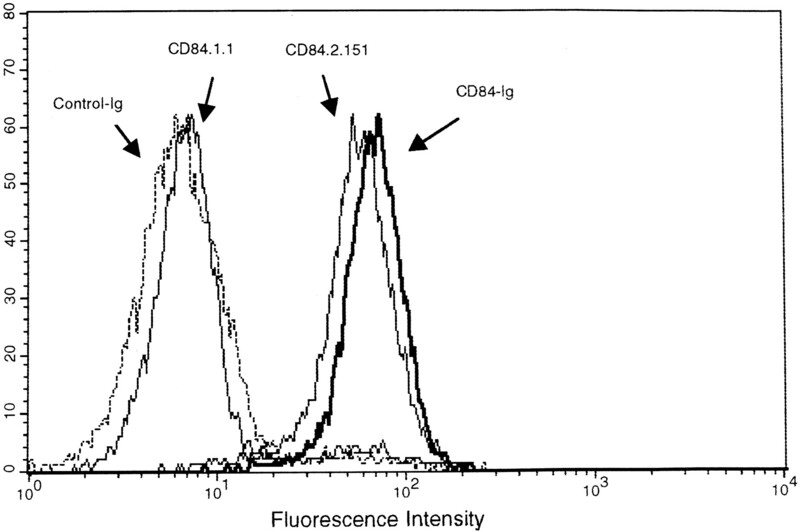 Briefly, stably transfected CD84–300.19 cells were first incubated with 10-fold saturating concentrations (determined after Ab titration and between 5 and 10 μg) of Fab of CD84 mAbs; then they were washed and stained with the CD84-Ig fusion protein at an optimal staining concentration. Thereafter, cells were incubated with a biotinylated anti-human Ab at 4°C for 30 min and then with streptavidin-PE (1/400 dilution). Samples were washed and measured by FACS. No cross-reactivity was detected between the Fab and the biotinylated secondary anti-human Ab. Fab irrelevant Ab and human Ly-9 Ig-fusion protein were used as controls. The 300.19 cells were stably transfected with human CD84 cDNA human/mouse chimeras. Mouse CD84 extracellular domain had replaced the first or second Ig-like domains of human CD84. The plasmid H1-M2 (human CD84 first domain and murine CD84 second domain) was constructed by substitution of the murine CD84 leader peptide and first domain with a fragment encoding the human CD84 leader peptide and domain 1 flanked by SalI sites on the murine CD84 cDNA cloned in pCI Neo vector. The plasmid M1-H2 (murine CD84 first domain and human CD84 second domain) was generated by ligation on SalI sites of the fragment encoding the leader peptide and domain 1 of the murine CD84 with the human CD84 cDNA, lacking the leader peptide and domain 1, cloned in pCI Neo. The CD84 mutant lacking the cytoplasmic tail was generated by PCR using CD84 cloned in PCI Neo as a template and the following oligonucleotides: 5′-CCC AAG CTT TTC CAC AGA AGG TTA GAC-3′ as forward and 5′-TGA GGC AGC TCA TTG TCT TCT CTT-3′ as reverse. It was cloned in pCI Neo vector. These transfectants were stained with CD84 mAbs and the CD84-Ig fusion protein as described above. To analyze IFN-γ secretion, cells were activated as reported previously (19). PBMCs were activated with a suboptimal concentration of previously titrated soluble anti-CD3 (data not shown) plus purified soluble CD84 mAb CD84.1.1, CD84.1.21, anti-CD150 (IPO-3), or control IgG at various concentrations. 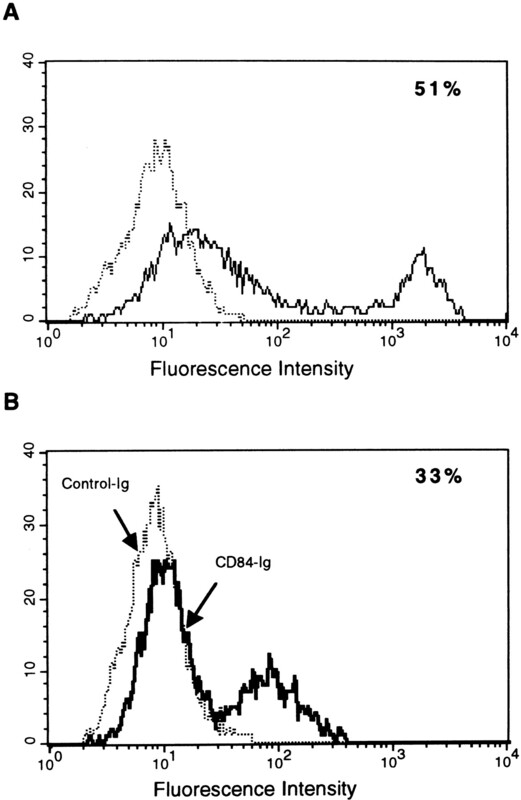 For CD84-Ig cytokine assays, an anti-human Fc Ig at 5 or 20 μg/ml was bound to 96-well plates. After incubation overnight at 4°C, the excess Ab was washed with sterile PBS, and the CD84-Ig or control-Ig (20–50 μg/ml) was added. Fusion proteins were incubated for 4 h at room temperature, and the plate was then washed to remove the unbound material before adding the cells and anti-CD3 to various concentrations. Supernatants were collected after 48 h of culture, and IFN-γ levels were measured by sandwich ELISA. Primary and biotinylated secondary anti-human IFN-γ Abs were used at the concentrations recommended by the manufacturer. The values reported are the mean of triplicate wells, and the SEM was <15%. A new panel of anti-CD84 mAbs was generated by immunizing the 300.19 murine pre-B cell line transfected with human CD84 cDNA. In this study we analyzed four CD84 mAbs reactive with CD84-transfected cells, but not untransfected 300.19 cells. CD84 mAbs (clones CD84.1.1, CD84.1.21, CD84.1.7, and CD84.2.151) similarly stained human cells and transfectants (Table I⇓). All these Abs had the same pattern of staining, although the intensity of fluorescence was higher in the case of CD84.1.21. Cross-blocking experiments showed that these mAbs recognized four epitopes; three of them (CD84.1.1, CD84.1.7, and CD84.1.21) were overlapping (Table II⇓). CD84 was expressed on almost all thymocytes (Fig. 1⇓A). It appears early during T cell differentiation, because CD4−CD8− immature thymocytes express this molecule. 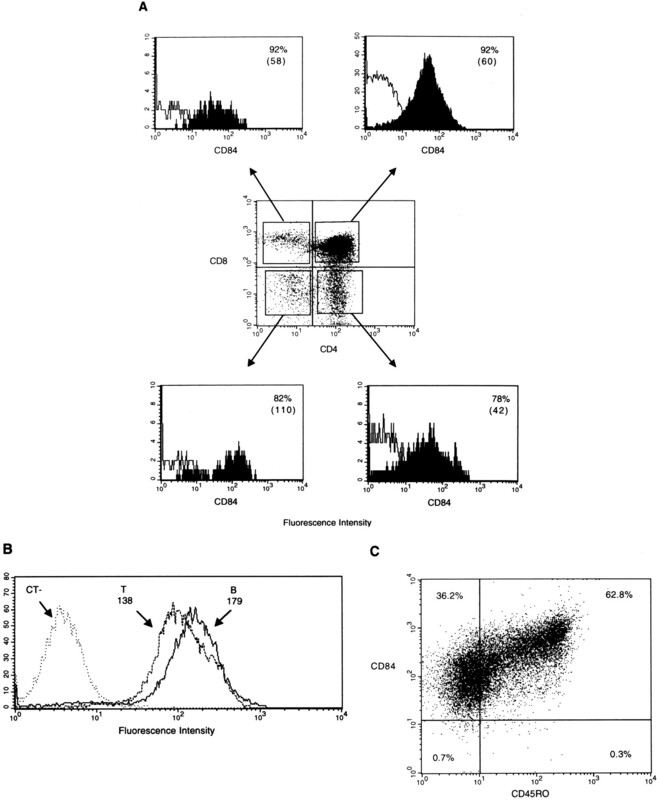 CD84 expression was higher on CD4−CD8− immature thymocytes than on double- or single-positive CD4+ or CD8+ thymocytes, as indicated by means of fluorescence. T lymphocytes were also positive for CD84, but the expression was lower than on B cells (Fig. 1⇓B and Table I⇑). On T cells, CD84 expression was higher on the CD45ROhigh memory cells subset (Fig. 1⇓C and Table I⇑). Our results show that CD84 is expressed not only on B cells, monocytes, and platelets, but also on thymocytes and T cells, indicating a broader role for CD84 in leukocyte function. CD84 is expressed on thymocytes, B cells, and T cells. A, Thymocytes were stained with anti-CD4-FITC, anti-CD8-PerCP, and biotinylated anti-CD84 (clone CD84.1.7) plus streptavidin-PE, and each population was studied. The MFI is indicated in each histogram. B, Lymphocytes from peripheral blood were stained with anti-CD3-allophycocyanin, CD19-FITC, and biotinylated anti-CD84 plus streptavidin. The MFI is shown in each histogram. C, CD45RO+-FITC and biotinylated anti-CD84 plus streptavidin-PE staining in lymphocytes from peripheral blood gated for CD3-allophycocyanin-positive cells. The percentage of positive cells is indicated. We studied the binding of CD84 to the described members of the CD2 subfamily. CD84-Ig binds to CD84-transfected cells, but no binding was detected on COS cells transfected with CD229, CD150, CD48, CD244, CD58, and CD2, showing that CD84 specifically binds to itself (Fig. 2⇓). Our data indicate that CD84 is a self ligand, which is consistent with a previous report on homophilic binding for CD150 (14). CD84 is a self ligand. COS-7 cells transfected with human CD84, CD229, CD150, CD48, CD244, CD58, and CD2 cDNA were labeled with CD84-Ig fusion protein. Protein expression was detected using specific Abs (left). CD84-Ig fusion protein binding was assayed (right). Immunostaining controls: isotype control (left) and C-Ig (CD62-P-Ig; right) are represented with dotted lines. The percentage of positive cells is indicated in each histogram. The anti-CD84 mAbs generated were used to perform competition assays with CD84-Ig. CD84 Fab were obtained to avoid the bridge formation due to the simultaneous interaction of CD84 mAb between the fusion protein and the CD84 from the cell surface. The CD84.1.1 mAb completely blocked binding of the fusion protein, whereas CD84.1.7 and CD84.1.21 hindered it only partially, and CD84.2.151 did not affect it (Fig. 3⇓). The CD84-Ig fusion protein binding is blocked by anti-CD84 mAbs, further demonstrating the homophilic interaction of this molecule. The mAbs against CD84 block the CD84-CD84-Ig fusion protein interaction. The CD84-Ig fusion protein binds to stable CD84 transfectants (solid line). Control-Ig (CD229-Ig) did not bind to these cells (dotted line). The mAb CD84.1.1 (5 μg) completely blocked CD84-Ig binding, unlike mAb CD84.2.151 (10 μg; indicated by arrows). An irrelevant Ab did not affect the CD84-Ig binding, being undistinguishable from the CD84-Ig staining displayed in the graph (solid line). To elucidate the ligand binding region, we mapped the domain involved in CD84-CD84 binding using human/mouse chimeras containing the first or second domain of the mouse CD84. CD84-Ig bound to the first human CD84 extracellular domain, but failed to bind to the second extracellular domain. The expressions of both chimeric receptors were comparable, as revealed by fluorescence (Fig. 4⇓). Moreover, the Abs that blocked CD84-Ig binding recognized epitopes located in the first Ig-like domain, whereas CD84.2.151, which did not compete for CD84-Ig binding, recognized the second extracellular domain (Fig. 4⇓). CD84 homophilic interaction involves only the first extracellular domain. A, The 300.19 cells stably transfected with human CD84 first extracellular domain and the murine CD84 second extracellular domain (H1-M2; upper panel) and cells transfected with murine CD84 first extracellular domain and human second extracellular domain (M1-H2; lower panel) were stained with anti-CD84 clone 1.1 (blocking CD84-Ig binding Ab; left column) or anti-CD84 clone 2.151 (non-blocking Ab; middle column). CD84-Ig binding was assayed (right column). MFI is represented in each histogram. B, The mAb CD84 1.1 completely blocked CD84-Ig binding (solid line indicated by arrows) in the H1-M2 chimera. An irrelevant Ab did not affect the CD84-Ig binding, being undistinguishable from the CD84-Ig staining displayed in the graph (solid line indicated by arrows). Control-Ig (CD229-Ig) did not bind to these cells (dotted line). To further characterize the CD84-CD84 interaction we assayed CD84-Ig binding to cells transfected with a truncated CD84 lacking the cytoplasmic tail. As shown in Fig. 5⇓, CD84 mutant was expressed on the cell surface (A), and it was able to bind to CD84-Ig similarly to wild-type CD84 (B). CD84-CD84 interaction is independent of its cytoplasmic tail. A, COS cells transfected with CD84 mutant lacking the cytoplasmic tail were stained with an mAb anti-CD84 (CD84.1.1; solid line) or an irrelevant Ab (dotted line). B, CD84-Ig (solid line) and control-Ig (CD229-Ig; dotted line) bindings were assayed on the transfected cells. The percentage of positive cells is indicated in each histogram. As shown in Fig. 6⇓A, CD84-Ig bound to platelets, whereas no binding was detected with the control-Ig protein. This binding was completely blocked by mAb CD84.1.1, but not by mAb CD84.2.151. No binding of CD84-Ig to lymphocytes could be observed (data not shown). 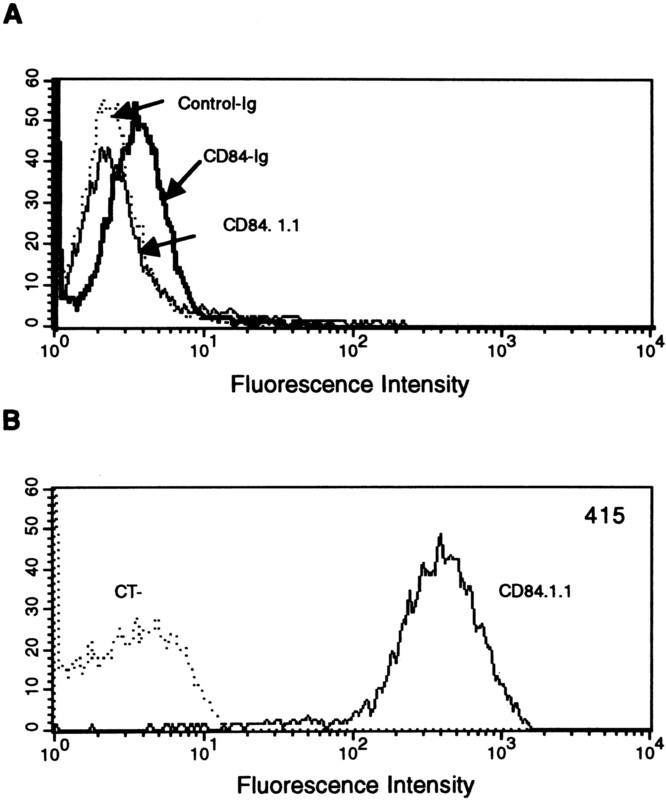 Note that platelets expressed higher CD84 levels (mean log fluorescence, 415) than T and B lymphocytes (mean log fluorescence intensities of 138 and 179; Figs. 1⇑ and 6⇓B and Table I⇑). These data show that CD84-Ig binds to normal cells with high levels of CD84 surface expression. CD84 homophilic binding occurs on normal cells. 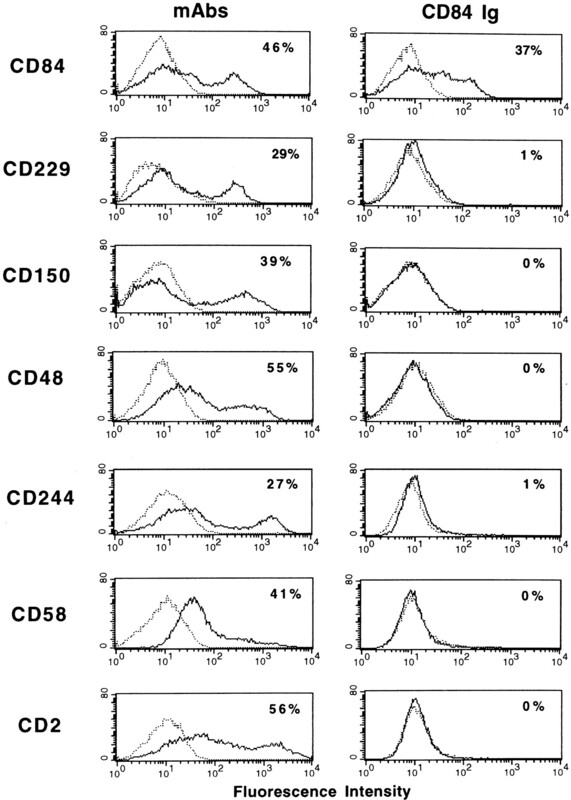 A, CD84-Ig (solid line) and control-Ig (CD229-Ig; dotted line) bindings were assayed on platelets. The cross-blocking experiment was conducted with Ab CD84.1.1 as indicated by arrows. B, Platelets were stained with mAb CD84.1.1. (solid line) and an irrelevant Ab (dotted line). The MFI is indicated. 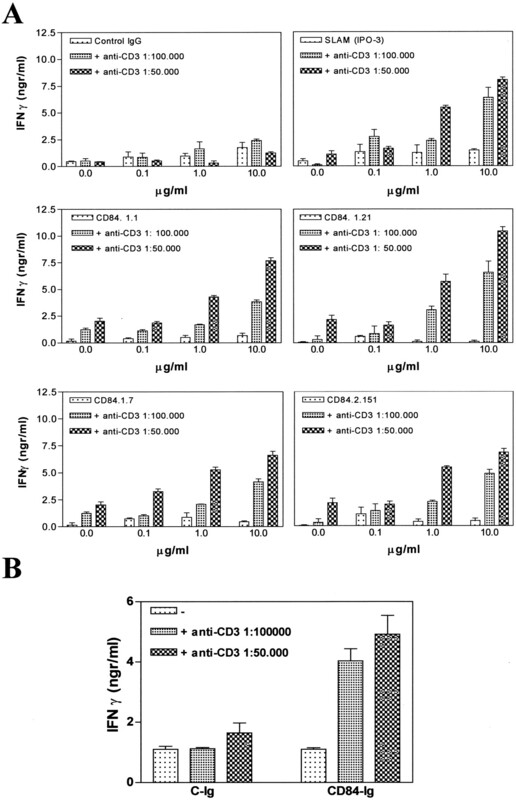 The ligation of CD84 with anti-CD84 mAbs enhanced IFN-γ secretion induced by suboptimal concentrations of anti-CD3 after 48 h of culture (Fig. 7⇓A). IFN-γ secretion levels were dose-dependent and equivalent to the levels induced by an anti-CD150 mAb, which was used as a positive control. CD84 mAb by itself did not enhance cytokine secretion, indicating that CD84 acts as a costimulatory molecule. Ligation of CD84 with Abs that recognized first (clone CD84.1.1) and second (clone CD84.2.151) extracellular domains induced similar effects on IFN-γ induction after TCR triggering. The CD84 Abs generated (clones CD84. 1.1, CD84.1.21, CD84.1.7, and CD84.2.151) are able to induce IFN-γ secretion. CD84 triggering induces IFN-γ secretion in the presence of suboptimal doses of anti-CD3. Lymphocytes from peripheral blood were activated with soluble anti-CD3 (clone 332A3) at suboptimal doses (1/50,000 and 1/100,000 dilution) and soluble CD84 Abs (clone CD84.1.1 and clone CD84.2.151), CD150 (IPO-3), or IgG control (same isotype as CD84 mAb) at concentrations ranging from 0.1 to 10 μg/ml (A) or CD84-Ig or control-Ig (CD229-Ig) fusion proteins (20 μg/ml) cross-linked to anti-human Fc plate-bound Ab (5 μg/ml; B) for 48 h. Supernatants were collected, and IFN-γ secretion was assayed. Triplicate determinations were performed. These data are representative of five experiments; the SD between experiments was <20%. Because the levels of IFN-γ secretion induced by soluble CD84-Ig were difficult to evaluate due to the Fc fragment of the fusion protein as well as the ability of these molecules to interact with themselves, we cross-linked CD84-Ig to an anti-human Fc Ab previously bound to the plate. In this fashion, CD84-Ig, bound to the anti-human Fc Ab by its Fc fragment exposed the CD84 domains to the cell more efficiently. As shown in Fig. 7⇑B, CD84-Ig consistently induces (2- to 3-fold) IFN-γ secretion at several anti-CD3 suboptimal concentrations. IL-4 secretion was not detected under the same conditions (data not shown). We present the first experimental evidence of CD84 homophilic interaction and its functional outcome. It has been postulated that the CD2 subset arose via successive duplications of a common ancestral gene originally encoding a homophilic cell adhesion molecule (29). The only known ligands of CD2-related cell surface receptors are other CD2 family members (8, 9, 10, 11, 12, 13, 14). In this study, we show that a soluble CD84-Fc fusion protein containing the two extracellular domains of CD84 binds to CD84-transfected cells, but not to cells transfected with the cDNA of the other members of the CD2 subfamily. CD84-Ig binding to CD84-transfected cells was inhibited in the presence of specific mAbs against CD84. Epitope-mapping studies performed with these CD84 mAbs demonstrated that mAbs with epitopes wholly within domain 1 blocked CD84-mediated binding. This result is consistent with our data obtained using CD84 human/mouse chimeras, which showed that CD84-Ig binds to domain 1. The CD84-CD84 homophilic interaction is species-restricted, because human CD84 does not bind to murine CD84, although murine CD84 can bind to itself (data not shown), indicating that the homophilic interaction of this molecule occurs in different species. It has been determined that the domains involved in adhesion between CD2 and human CD58 and mouse CD48, and between 2B4 and CD48 are the N-terminal Ig V domains (1). These observations suggest that CD84 expressed on the surface of adjacent cells establishes head-to-head contacts. These data also agree with the finding that soluble CD2 crystals are dominated by homophilic head-to-head dimers and that these crystal contacts mimic the topology of the natural ligand interaction CD2-CD58 (30). Because the cytoplasmic region of platelet endothelial cell adhesion molecule-1 (CD31), another homophilic binding receptor of the Ig superfamily, has been shown to be critical for its binding (31), we tested the interaction of CD84-Ig with cells transfected with a CD84 mutant that lacks the cytoplasmic domain. Our results show that the cytoplasmic domain does not control its homophilic ligand-binding property, because CD84-Ig binding is not affected in the CD84 mutant. Recently, it was reported that one of the members of the CD2 subset, CD150, binds to itself (14). Although CD150 self-associates with very low affinity, its functional significance has not been ruled out. Moreover, it has been reported that soluble and membrane-bound CD150 enhance B cell proliferation and Ig synthesis (32). We cannot rule out additional counter-receptors for CD84 and CD150 among emerging members of the CD2 subfamily. CD84-CD84 interaction takes place in normal cells. Because platelets are known to express higher levels of CD84 than lymphocytes, we tested the interaction of the fusion protein with these cells. CD84-Ig bound to platelets, and this binding was specifically blocked by CD84 mAb recognizing domain 1, but not domain 2. This demonstrates that the binding was specific and involved the first extracellular domain of the molecule, as we previously showed with CD84 chimeras. The fact that we did not observe CD84-CD84 binding on lymphocytes may have various explanations. One is that the concentration of monomeric CD84-Ig available for binding to CD84 is far lower than the total concentration of fusion protein that minimizes binding to the cell receptor on the cell surface. A high density on the cell surface may be needed to detect binding. Another explanation is that most homophilic adhesion receptors interact with low affinities (14). Ligation of CD84 with specific mAbs, such as CD2, CD150, and CD244 mAbs, modulates T cell activation (19, 20, 21, 33). The mAbs against CD84 increased IFN-γ secretion through the TCR, similarly to CD150. All Abs against CD84 used had a functional effect. Thus, the induction of IFN-γ was epitope independent. Moreover, CD84-CD84Ig interaction enhances IFN-γ levels, showing that this homophilic interaction has functional significance. CD150 engagement enhances the Th1 cytokine production profile, and it can reverse the Th2 phenotype to Th1 (19). This suggests that during immune reactions CD150 triggering may also participate in directing expanding T cells toward a Th0/Th1 pathway. Interestingly, IL-4 secretion was not enhanced after CD84 triggering with either mAb or fusion protein. 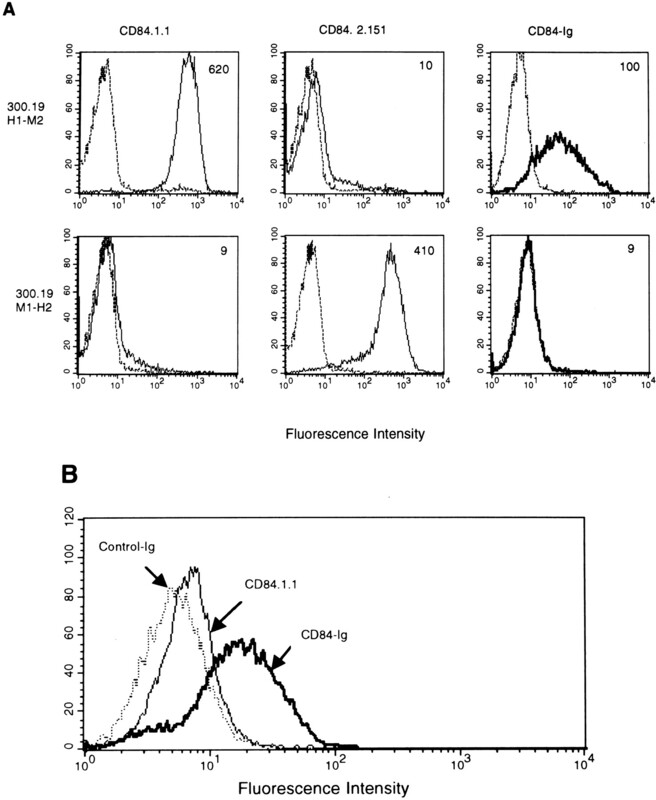 On this basis, we speculate that CD84 behaves similarly to CD150. In addition, altered CD150 expression has been described in autoimmune diseases such as rheumatoid arthritis (34) and multiple sclerosis (35), in which dysregulation of IFN-γ occurs. Similarly, CD84 expression may be affected. To date, the importance of CD84 signaling in T lymphocytes is derived from the observation that SH2D1A, a protein responsible for the XLP, binds to the cytoplasmic region of CD84 (25). XLP disease is characterized by three major phenotypes: fatal mononucleosis, B cell lymphomas, and dysgammaglobulinemia (36, 37, 38). SH2D1A protein binds to at least three other leukocyte cell surface receptors of the CD2 subset (CD150, CD244, and CD229), and its association prevents recruitment of the tyrosine phosphatase SHP-2 to their cytoplasmic tails, although the functional consequences of this event are still unclear (22, 24, 25). Comparative studies with normal lymphocytes and lymphocytes from XLP patients have revealed the functional requirements for SH2D1A-CD244-mediated activation of human NK cells function. CD244 fails to induce cytotoxicity in SAP-deficient cells from XLP patients, which may contribute to the pathogenesis and progression of the disease (39). In contrast, an inhibitory function of CD244 has been implicated in the inability of NK to kill EBV-infected cells in XLP patients (40). It appears, therefore, that CD84 signaling may also be involved in the molecular pathogenesis of XLP. Defects in IFN-γ production after CD84 triggering in SH2D1A-deficient cells may impair viral clearance, as occurs with EBV infection in XLP patients; this has also been proposed for CD150 (41). This suggests that the complex phenotype of XLP could be due to a combination of altered signaling pathways initiated by these four cell surface receptors (42). Further biochemical and functional characterization of these receptors is essential to our understanding of the molecular basis of the disease. Because CD84 is expressed on thymocytes, various subsets of T and B lymphocytes, monocytes, and platelets, the CD84-CD84 interaction extends the range of possible cellular interactions regulated by the homophilic binding of CD84. We thank Isabel Sánchez for assistance with the experiments, Dr. M. Streuli for providing 300.19 cells, Dr. Thorley Lawson for CD48 cDNA, and Dr. Vilella for mAbs. ↵1 This work was supported by Grants SAF97-0136 and SAF00-037 from the Comisión Interministerial de Ciencia y Tecnología. M.M. is supported by a fellowship from the Ministerio de Educación y Cultura, X.R. is a fellow of the Programa de Formació en la Recerca i la Docència (Universitat de Barcelona), and V.T. and N.Z. are fellows of the Programa Nacional de Formación de Personal Investigador. ↵3 Abbreviations used in this paper: SHP, Src homology 2 domain-containing protein tyrosine phosphatase; SH2D1A, Src homology 2 domain-containing protein 1A; SAP, signaling lymphocytic activation molecule-associated protein; XLP, X-linked lymphoproliferative disease. Engel, P., N. Wagner, and T. F. Tedder. 1995. CDw84 workshop report. In Leucocyte Typing V: White Cell Differentiation Antigens, Vol. 1. S. F. Schlossman, L. Boumsell, W. Gilks, J. M. Harlan, T. Kishimoto, C. Morimoto, J. Ritz, S. Shaw, R. Silverstein, T. A. Springer, et al., eds. Oxford Univ. Press, Oxford, p. 699.
de la Fuente, M. A., P. Pizcueta, and P. Engel. 1997. CD84 workshop panel report. In Leucocyte Typing VI: White Cell Differentiation Antigens, Vol. 1. T. Kishimoto, H. Kikutani, A. E. G. Kr. von dem Borne, S. M Goyert, D. Y. Mason, M. Miyasaka, L. Moretta, K. Okumura, S. Shaw, T. A. Springer, K. Sugamura, and H. Zola, eds. Garland, New York and London, p. 193.